"The Aho-Soldan family is without a doubt one of the most influential families in Finnish cultural history". 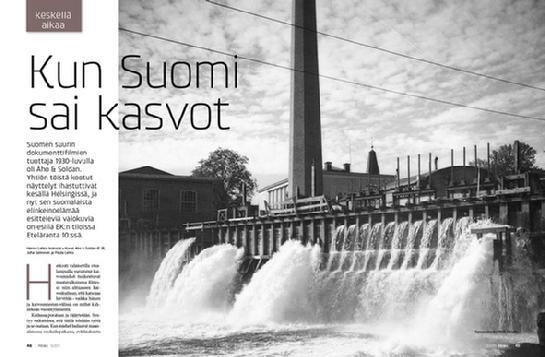 Confederation of Finnish Industries´ magazine PRIMA nr 5, September 8, 2011 pages 48 - 53 "When Finland got a Face"
Elinkeinoelämän Keskusliiton EK:n PRIMA - lehti nro 5, 8.9.2011 s 48 - 53 "Kun Suomi sai kasvot"
CLICK THE PHOTO TO DOWNLOAD THE ARTICLE ! "The Aho-Soldan family is without a doubt one of the most influential families in Finnish cultural history. Forefather Juhani Aho (1861-1921) was a novelist and a journalist, one of the founders of Helsingin Sanomat (then known as Päivälehti) and the first professional novelist writing in Finnish. He was a passionate Fennoman: born Johannes Brofeldt, he changed his name to Juhani Aho in 1907. Aho’s personal life was colourful, to say the least. He had a tendency towards melancholy and had several intense love affairs. He was married to artist Venny Soldan-Brofeldt, who was bohemian but somewhat reserved. They had two sons, Heikki and Antti. Aho also fell in love with Venny’s younger sister, fragile and compassionate Tilly Soldan, and they had a son, Björn. Heikki and Björn, who were thus both half-brothers and cousins, became a tight-knit duo as children, and later on their professional careers were based on perfectly complementing each other. 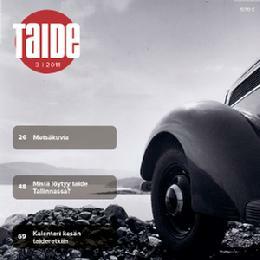 They were pioneers of Finnish documentary film and reformers of photography. They were most productive during the 1930’s, when they captured the spirit of a modern nation’s bustling industry and vivid city life. This year is the 150th anniversary of Juhani Aho’s birth, which is being celebrated with several exhibitions and publications". Viikon tietokirja: "Kaupunkilaiselämää - 1930-luvun Helsinkiä". Ilkka Kippolan haastattelu. CAMERA-magazine nr 6-7/2011 - "AHO & SOLDAN - The fathers of Machine- and National Romanticism"
KAMERA-lehti 6-7/2011 s 26-33 - "AHO & SOLDAN - Kone- ja kansallisromantiikan isät"
Hufvudstadsbladet 1.6.2011 s. 19 - "Förälskad i Helsingfors"
Hufvudstadsbladet May 14, 2011 - "Finland Stands Proud"
Hufvudstadsbladet 14.5.2011 - "Finland sträcker på sig"
Helsingin Sanomat magazine (Culture) C1 May 6, 2011- "Travels to Finland Past"
Helsingin Sanomat Kulttuuri C1 6.5.2011 - "Matkoja entiseen Suomeen"
Optio - magazine (Kauppalehti) nr 8/2011, pages 34-41 - "The Pioneers of the Finland-Image"
Optio 8/2011 s. 34-41 - "Suomi-kuvan pioneerit"
Travel-magazine, June 2011 page 6 "Constructing the Image of Finland"
Matkaan-lehti sivu 6 heinäkuu 2011 "Suomi-kuvaa rakentamassa"
Kauppalehti, December 7, 2011 pages 30-31 - "The Gentleman surrenders be Photographed"
Kauppalehti 7.12.2010 sivut 30-31 - "Herrasmies antautui kuvattavaksi"
Helsingin Sanomat October 22, 2010 - "Still Images of Sibelius"
Helsingin Sanomat 22.10.2010 - "Pysäytyskuvia Sibeliuksesta"